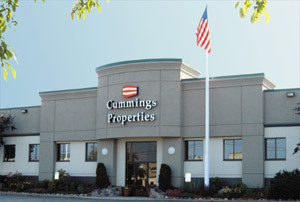 Cummings Properties is one of Massachusetts most prominent, full-service commercial real estate development and property management firms. It currently operates more than 9 million square feet of commercial property in 10 metropolitan Boston communities. With 40 years of successful development and property management expertise, 300 regular full-time staff represent the full spectrum of development, management, and construction disciplines. Cummings Properties enjoys a long-standing reputation for service and excellence. TradeCenter 128 was 100 percent designed by the Company's full-time architectural, engineering, and design staff. It was then built with the Company's own mechanical and supervisory group with Cummings' outstanding group of buildings trades subcontractors. Cummings Properties was recently named by BUILDINGS Magazine to its A List of the top 25 Real Estate firms in the United States! The only real estate firm headquartered in New England to be included, Cummings appeared following such national real estate powerhouses as C. B. Richard Ellis, Cushman & Wakefield, Wal-Mart, Hines, Boeing Company, Jones Lang LaSalle, and GSA.